A man (Daniel Craig) wakes up alone in the desert. Doesn't know where he is or how he got there. All he knows is he has a strange, exotic shackle on his right wrist, although, again, he doesn't know what it is or how it got there and he can't get it off. He's the 1873 version of Jason Bourne. And we learn this soon enough when three ominous guys spitting chaw turn up and this mystery man dispatches them all in an instant. He puts on one of the assaulter's hats (luckily it's black!) and rides into the nearest town, Absolution, a town that has the requisite saloon and pretty young miss (Olivia Wilde) and sheriff (Keith Carradine) and young, renegade son Percy (Paul Dano) of the businessman Woodrow Dolarhyde (Harrison Ford) who really runs the town who has long neglected his young son which has caused the son to go renegade. It doesn't take long for this mystery man to encounter Percy and knee him in the groin which leads to Percy accidentally shooting a deputy which leads to him getting locked up and his father riding into town to set things straight. But it's also at this moment we get a bearing on the mystery man - he is Jake Lonergan, a criminal wanted by, amongst many others, Dolarhyde for thieving his precious gold. But before Percy and Lonergan can be transferred out of town in handcuffs and before Dolarhyde can prevent this from happening so he can save his son and get his own hands on Lonergan, what should appear in the Old West night sky but an alien ship that fires lasers, snatches up innocent townfolk and whisks them away and seems intent on destroying the entire place until, unwittingly, Lonergan discovers the shackle on his wrist fires a gigantic laser of its own, which manages to chase off these hell-bent E.T.'s. And so with Percy and the moustachioed saloon owner's (Sam Rockwell) wife and the sheriff and others having been taken by the aliens, a posse is formed, led by Lonergan and Dolarhyde, to track the aliens and get back their people. And while the rest of the film will feature the expected stopovers with the rest of Jake's old gang and Indians that at first appear people evil but turn out to be helpful the comparisons to its western roots really kinda end once they ride out of the town. CGI or not CGI? You make the call. For instance, Craig's mystery shackle. It would seem to possess a large and potentially unique secret, no? No. It just shoots a laser. That's it. Blah-be-blah. And yes, it's employed at the end to help win the day but, again, in a most lackluster fashion. It's the whole film in a nutshell. Nice set-up but, uh, now what? By the time the posse has arrived at the giant alien spaceship the film is just going through antiquated motions and goes for an end not out of place in bummer action movies that have no cowboys and no aliens. 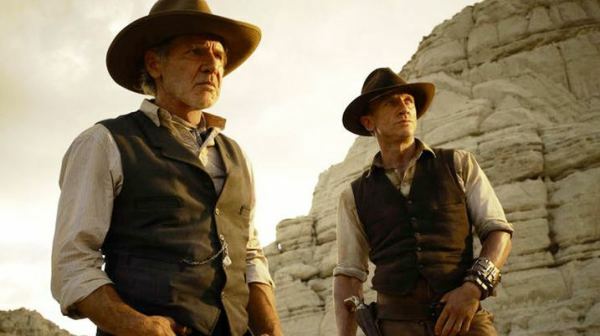 Cut loose, "Cowboys & Aliens!" CUT LOOSE!!! It loses his hold on its roots in the western, forsaking the setpiece of the town of Absolution. Normally in these sorts of films the good townfolk finally band together behind a stranger to go after the bad guys who have been lording them for too long and "Cowboys & Aliens" presented an opportunity for both the good guys and the bad guys to band together to save their town from an otherworldly foe. Alas. At the end of the screening I attended, people in the audience applauded. Honest to goodness applause. I literally said out loud to myself as this was happening, "Really? This movie?" Were those people insane or have I just fallen that out of touch with what does or does not make a quality mainstream motion picture? Or is the summer of '11 really as bad as the legend being cultivated and compared to all the other dreck those clapping souls have had to sit through this seemed pretty darn good? Or were they just glad it finally ended? Olivia Wilde really is that beautiful. In fact, Megan Fox was once quoted as wanting to sleep with her. I totally hear you that this was surprisingly unimaginative and that Favreau and the writers should have "let is loose" and gone totally over-the-top. Olivia Wilde is stunning but her character was basically unplayable. And when she is thrown into the fire and reappears... that was pathetic. Good review Nick! Thank you, sir. I agree with you about that fire scene. It just seemed like a fancy excuse to get her, uh, clothes-less.